Jul. 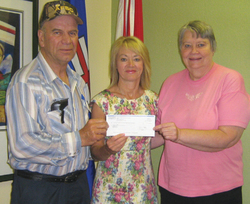 24, 2014 6:00 a.m.
On Monday, July 14, Honourable Diana McQueen, Minister of Energy and MLA for Drayton Valley-Devon, met with Warburg Agricultural Society President Les Nemeth and Ag Society member Treasa Nemeth at the constituency office. Mrs. McQueen presented them with a cheque for $17,578 for the purchase and set up of an emergency generator for the Warburg Pioneer Community Hall. According to Village of Warburg CAO Chris Pankewitz, the new natural gas powered emergency generator will ensure the hall’s lights, furnace and water works will be operational should regular power fail following a disaster situation. This is especially important because the hall is officially designated as the go-to emergency shelter for residents of the Warburg area. The Ag Society was successful its grant application to the Alberta Agriculture and Rural Development Agricultural Initiatives Program which is funded through the Alberta Lottery Fund. The Agricultural Initiatives Program is a provincial program that boosts improvements in agriculture, rural development and the quality of agricultural community life with a focus on keeping existing local facilities functioning and workable. Funding is granted to agricultural societies that are incorporated under the Agricultural Societies Act (Alberta). Other registered not-for-profit organizations whose objectives relate to agriculture and rural development are also considered.